California Educators: Strengthen your understanding and enact — or facilitate implementation of — pedagogical practices and deeper learning for culturally and linguistically diverse students. 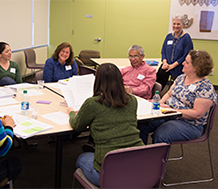 Participate in our ELA/ELD Framework Intensive Institute. Districts can also request to host the institute. Professional development is differentiated in four grade spans (transitional kindergarten TK-1, 2-3, 4-6, 6-12) and includes implementation planning for site and district administrators. Site- and district-level leadership teams and site-level instructional teams are encouraged to participate together for optimal learning and implementation. An institute can be contracted for 100 TK-5 participants or 120 TK-12 participants by districts. * Please contact Annette Gregg at agregg@wested.org or 510.326.2342 for information on dates and locations. You may also check the Summer Institutes page periodically, as dates and locations will be posted when available. The ELA/ELD Framework is California’s comprehensive approach to supporting all students — with a particular emphasis on English learners — to develop academic literacy, analytical practices, and deep content understanding across disciplines. This institute will help you deepen your understanding of the framework for English learner student success. The cost to attend a three-day institute is $1,500/person; $1,300/person in teams of 4 or more. To learn more, please contact Annette Gregg at agregg@wested.org or 510.326.2342. 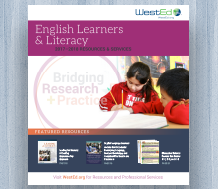 Support the academic success of English learners and students with low literacy skills. Check out WestEd's services and resources. Understand and implement effective instruction for culturally and linguistically diverse learners.